In our last blog post, we created a map of the Strategy game genre to explore how gamers’ preferences for Excitement or Strategy can influence the types of strategy games they are likely to play. But gaming motivations not only impact genre preference, they also impact playstyle within game genres. The infamous Leeroy Jenkins video exemplifies the charge-first-think-later playstyle, and it often isn’t the most effective. That said, many of us can appreciate the urge to get straight to the fun and not worry so much about the outcome. Many games balance risk versus reward, strategy versus action in this way. One of the genres where this relationship can be seen most clearly is in First Person Shooters (FPS). Many games balance risk versus reward, strategy versus action. Destiny, for example, allows players to choose between weapons that are better suited for one style or another. Players can pick their loadouts depending on whether they want to sit back and methodically pick the enemy apart (e.g., scout rifles, sniper rifles) or jump directly into the action and kills things quickly, but expose themselves to additional risk in the process (e.g., auto rifles, shotguns). But who are the gamers who tend to favor fast moving, close-quarters encounters? And how are they different from the gamers who prefer eliminating the enemy from a distance? That’s what we’ll focus on in this post. In addition to the Gamer Motivation Profile, we have research surveys that gamers can participate in. These surveys tackle a variety of game preference questions, and we can link gamers’ responses back to their motivation scores. 1,082 gamers participated in this research survey. 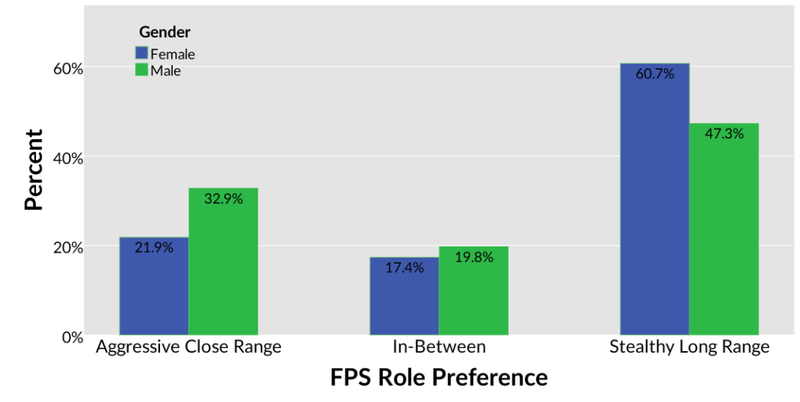 In the survey question about FPS role preference, 55 respondents indicated they were not familiar with the FPS genre, resulting in 1,027 valid responses. A higher proportion of male gamers preferred aggressive, close range tactics when compared with female gamers. Stealthy, long-range encounters on the other hand are preferred by a larger proportion of women compared to men. Interestingly, both groups were consistent in having the stealthy approach as the most popular answer, followed by close range tactics. An “in-between” approach was the least popular answer with both men and women. In terms of age, older players prefer a stealthier, long range approach while younger players prefer run-and-gun close range tactics. The demographic trends here are consistent with our recent results reviewing gender differences in gaming motivations, and how those shift with age. The chart below shows the mean ages for each preference group, with the error bars indicating 95% confidence intervals. 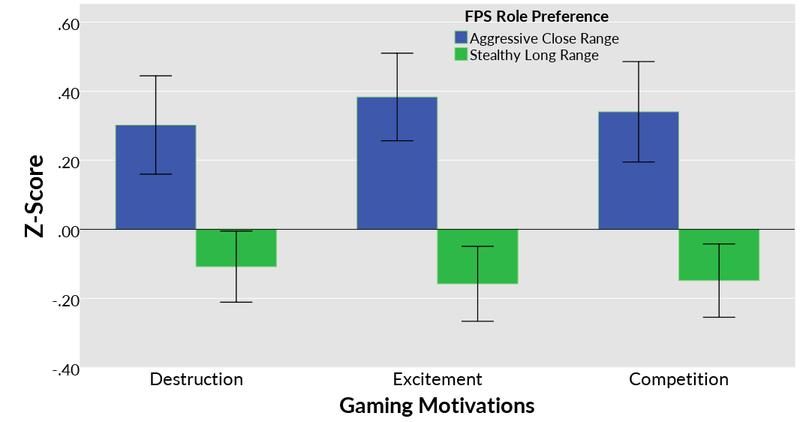 Our Gamer Motivation Model distills gaming preferences into 12 distinct motivations. 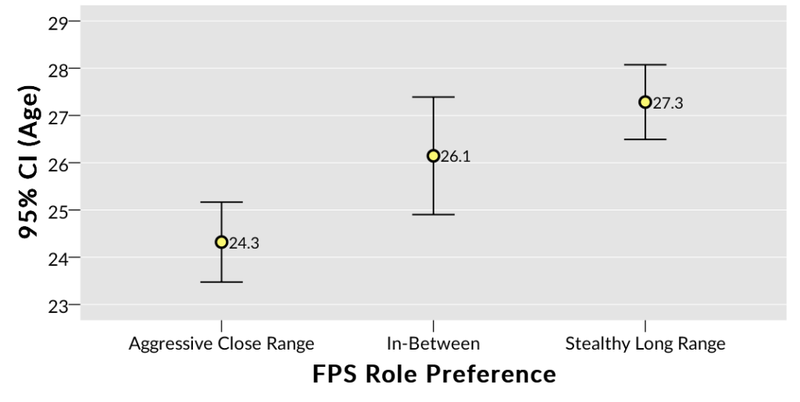 By linking gamers’ motivation data to their responses in the research survey, we can see how FPS role preference varies by gaming motivations. Gamers who prefer aggressive close-range combat score higher on Destruction (guns, chaos, explosives, and mayhem), Excitement (fast paced, action, surprises, and thrills) and Competition (duels, matches, scoring high on rankings). It makes sense that the run-and-gun gamers are more action-oriented and confrontational. For gamers, knowing your motivation profile might help you reflect on your FPS gameplay. Those who have high scores for Destruction and Excitement may need to remind themselves to be more cautious, whereas those with lower Destruction and Excitement scores may need to push themselves outside of their comfort zone (and trade their sniper rifle for a shotgun) to reach their full potential. At the team or clan level, these motivation profiles may also help optimize role assignment based on individual preferences. How much Leeroy do you have in you? Take a 5-minute survey and see how your Gamer Motivation Profile compares with other gamers. In the end, poor Leeroy’s attempt did not work out for the best. Perhaps if he had been screened by his guild leader for potentially risky behavior (i.e., high Destruction and Excitement scores) that particular wipe could have been avoided. Take the Gamer Motivation Profile to see how much Leeroy Jenkins you might have in you. [Update on Effect Sizes (2016-02-03) — Nick Yee] For you stat geeks out there, here are the effect sizes. To make it easier to compare everything using the same effect size measure of r, I simplified things a bit and compared only the Stealth vs. Aggro groups. For Gender, the effect size was r = .15. For Age, r = .18. For the motivations, Destruction was r = .21, Competition was r = .24, and Excitement was r = .28. Do yo have data about ammunition consumption ? I wonder if it is a significant axis. It will of course correlate with the long-range precision vs. automatic weapons continuum, but it might also better discriminate along a range of aggressiveness between users of automatic weapons. Hey Jean-Marc. We didn’t ask about ammo consumption specifically. I’m guessing it’s most related to our Destruction+Excitement motivations. But definitely a good follow-up question to ask in the future. Accurate as heck for me personally; I’m a 28-year-old woman, and I vastly prefer sniper rifles (or long-distance sniping with arrows, as in Skyrim). I find it so much easier and in fact more fun to find a good perch and methodically clear an area from afar before going in for loot and quest items. Hi Somnomania, it seems many would agree with you! That was actually one of the things that I found most interesting about these results. I did not expect the majority of players to prefer a long distance/stealthy approach but that appears to be the case. In the future it might be interesting to look at stealth and distance independently, as I’m someone who loves a good sniper rifle but can’t really be bothered to sneak around. Hi! While I mostly fit in the in-between group I would be interested to see a follow-up by weapon choice for each group. My other question is, given the small effect sizes, do you think that you are missing some mediating variable? To me, the results seem logical, but the effects aren’t nearly as strong as they should be if this were the true picture. What other factors do you think could be influencing the relationships discussed here? I think there may be a couple of things dampening the effect size. First, we’re asking this across FPS games, and different FPS games balance close vs. long range differently, so respondents don’t all come in with the exact same model of the underlying trade-offs. If we asked this of respondents of a specific game who all have the same reference point, the effect size would presumably increase. Related to this is that the research survey was targeted at gamers in general regardless of their preferred game genres. Respondents were allowed to indicate they are not familiar with the FPS genre, but this means we’re likely still including some respondents who are not core FPS genre players (where, again, their mental model of the trade-offs may not be the same as someone who is familiar with the genre). I was also thinking in terms of reaction time and age, that the preference for long-range by “older” cohorts could also be a function of processing speed/reaction time. I think it would be interesting to see how this data relates to processing speed, general intelligence, etc. So age is actually a better predictor than gender, and (somewhat unsurprisingly) motivations are better again. Can you do both age * gender at the same time? There may be a Simpson’s paradox here if the gamer demographics are skewed much younger for males than for female. You’re correct on the effect size order. For the interaction, long-range is significantly older than close-range for both men and women.